3–9 (up to 15 grams) grams in Decoction. Cold, Fever, Heat-type Diarrhea, 1½ gram doses of the powder, three times daily. Influenza and Pneumonia, take 3 grams of the powder, three times daily. Bronchitis and Pneumonia, decoct 15 grams with suitable herbs. 2. Its cold and bitter nature is moderated with Cardamon, Cinnamon and warming spices to avoid aggravating Vata/Wind. 2. Not used in bleeding disorders. 4. It has demonstrated Anti-Fertility activity; avoid in Sterility or in those trying to conceive. 5. Large doses aggravated gastrointestinal tract and may induce vomiting. –Antimicrobial activity of Andrographis paniculata. –Synthesis and evaluation of antibacterial activities of andrographolide analogues. –Broad-spectrum antiviral properties of andrographolide. –Antiviral properties of ent-labdene diterpenes of Andrographis paniculata nees, inhibitors of herpes simplex virus type 1. –The anti-inflammatory effect of Andrographis paniculata (Burm. f.) Nees on pelvic inflammatory disease in rats through down-regulation of the NF-κB pathway. –Anti-inflammatory activities of some species of andrographis wall. (Acanthaceae). –Antioxidant and anti-inflammatory activities of the plant Andrographis paniculata Nees. –Hepatoprotective and antioxidant property of Andrographis paniculata (Nees) in BHC induced liver damage in mice. –Antipyretic activities of some species of andrographis wall. 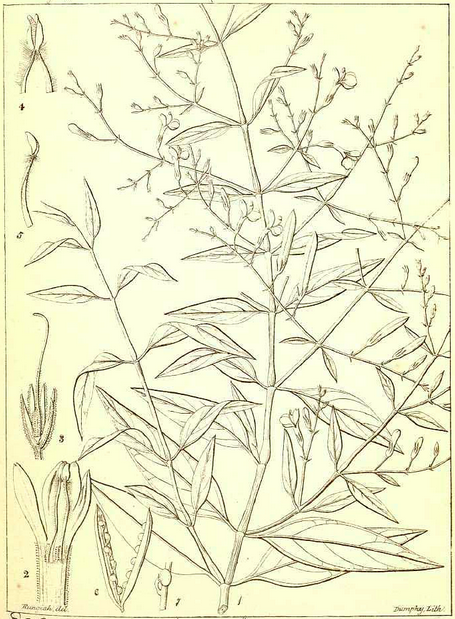 –Immunostimulant agents from Andrographis paniculata. –Anticancer and immunostimulatory compounds from Andrographis paniculata. –Evaluation of immunomodulatory activity of an extract of andrographolides from Andographis paniculata. –Prevention of common colds with Andrographis paniculata dried extract. A Pilot double blind trial. –Controlled clinical study of standardized Andrographis paniculata extract in common cold - a pilot trial. –Andrographis paniculata (Chuān Xīn Lián) for symptomatic relief of acute respiratory tract infections in adults and children: A systematic review and meta-analysis. –Double-blind, placebo-controlled pilot and phase III study of activity of standardized Andrographis paniculata Herba Nees extract fixed combination (Kan jang) in the treatment of uncomplicated upper-respiratory tract infection. –A double blind, placebo-controlled study of Andrographis paniculata fixed combination Kan Jang in the treatment of acute upper respiratory tract infections including sinusitis. –Andrographis paniculata in the symptomatic treatment of uncomplicated upper respiratory tract infection: systematic review of randomized controlled trials. –Andrographis paniculata for the treatment of upper respiratory infection: a systematic review by the natural standard research collaboration. –Clinical studies on kalmegh (andrographis paniculata nees) in infective hepatitis. –Hepatoprotective Effect of A Polyherbal Extract Containing Andrographis Paniculata, Tinospora Cordifolia and Solanum Nigrum Against Paracetamol Induced Hepatotoxicity. –Hepatoprotective activity of andrographolide from Andrographis paniculata against carbontetrachloride. –Hepatoprotective activity of andrographolide against galactosamine & paracetamol intoxication in rats. –Hepatoprotective effects of Andrographis paniculata against carbon tetrachloride-induced liver damage. –Antihepatotoxic effects of major diterpenoid constituents of Andrographis paniculata. –Andrographolide protects rat hepatocytes against paracetamol-induced damage. –Hepatoprotective effect of leaf extracts of Andrographis lineata nees on liver damage caused by carbon tetrachloride in rats. –Antivenom activities of some species of andrographis wall. –Antithrombotic effects of Andrographis paniculata nees in preventing myocardial infarction. –Inhibitory effect of Andrographis paniculata extract and its active diterpenoids on platelet aggregation. –Hypotensive activity of aqueous extract of Andrographis paniculata in rats. –[Advances in study on anti-tumor mechanism of andrographolide]. –Anti-tumor activities of andrographolide, a diterpene from Andrographis paniculata, by inducing apoptosis and inhibiting VEGF level. –Potency of andrographolide as an antitumor compound in BHC-induced liver damage. –Andrographolide: a new plant-derived antineoplastic entity on horizon. –Andrographolide Exhibits Anticancer Potential Against Human Colon Cancer Cells by Inducing Cell Cycle Arrest and Programmed Cell Death via Augmentation of Intracellular Reactive Oxygen Species Level. –Andrographolide inhibits proliferation and induces cell cycle arrest and apoptosis in human melanoma cells. –Andrographolide, a diterpene lactone from Andrographis paniculata and its therapeutic promises in cancer. –Andrographolide enhanced 5-fluorouracil-induced antitumor effect in colorectal cancer via inhibition of c-MET pathway. –In vivo inhibitory activity of andrographolide derivative ADN-9 against liver cancer and its mechanisms involved in inhibition of tumor angiogenesis. –The adjuvant value of Andrographis paniculata in metastatic esophageal cancer treatment - from preclinical perspectives. –Cytotoxic Components Against Human Oral Squamous Cell Carcinoma Isolated from Andrographis paniculata. –Andrographolide isolated from Andrographis paniculata induces cell cycle arrest and mitochondrial-mediated apoptosis in human leukemic HL-60 cells. –Apoptosis inducing effect of andrographolide on TD-47 human breast cancer cell line. –Synergistic anticancer effects of andrographolide and paclitaxel against A549 NSCLC cells. –Antiangiogenic activity of Andrographis paniculata extract and andrographolide. –Antifertility effect of andrographis paniculata in mice. –Antifertility effect of Andrographis paniculata (Nees) in male albino rat. –Andrographolide presents therapeutic effect on ulcerative colitis through the inhibition of IL-23/IL-17 axis. –Andrographolide derivative CX-10 ameliorates dextran sulphate sodium-induced ulcerative colitis in mice: Involvement of NF-κB and MAPK signalling pathways. –Randomised clinical trial: herbal extract HMPL-004 in active ulcerative colitis - a double-blind comparison with sustained release mesalazine. –Andrographolide Benefits Rheumatoid Arthritis via Inhibiting MAPK Pathways. –Efficacy of an Andrographis paniculata composition for the relief of rheumatoid arthritis symptoms: a prospective randomized placebo-controlled trial. –Renoprotective effects of Andrographis paniculata (Burm. f.) Nees in rats. –Anti-Diabetic Activity and Metabolic Changes Induced by Andrographis paniculata Plant Extract in Obese Diabetic Rats. –Hypoglycaemic effects of Andrographis paniculata Nees on non-diabetic rabbits. –Antihyperglycaemic and anti-oxidant properties of Andrographis paniculata in normal and diabetic rats. –Anti-diabetic property of ethanolic extract of Andrographis paniculata in streptozotocin-diabetic rats. –Antihyperglycemic effect of andrographolide in streptozotocin-induced diabetic rats. –Andrographolide recovers cognitive impairment in a natural model of Alzheimer's disease (Octodon degus). –The Antiaging Properties of Andrographis paniculata by Activation Epidermal Cell Stemness. –Screening of indigenous plants for anthelmintic action against human Ascaris lumbricoides: Part--II. –Filaricidal properties of a wild herb, Andrographis paniculata.